If you drive a gas-powered car, its battery provides the energy to turn your starter motor, crank the engine and get it running. It also powers components like onboard computers, clocks, radios and alarms when the engine is off. Batteries are compact, reasonably priced and provide a strong current to get your car started in all types of weather conditions. But they do eventually wear out — a process that can be accelerated by things like cold weather, leaving the lights on or only driving short distances. Let’s look at how the battery works, and the problems that can befall it. Why does your battery go bad? Most drivers don’t realize their battery is going bad until their vehicle won’t start. Here are some of the many ways that batteries can fail. Your headlights are a huge drain on the battery. Without the engine running, the alternator can’t recharge your battery. Leave the lights on long enough, and you’ve got a dead battery. This can also happen if you leave the interior lights on, or if the trunk doesn’t close completely. If your vehicle won’t start on its own, a jumpstart is often the next step to try to get your car running. But it’s important to know what you're doing so that you don’t make things worse or injure yourself. Follow these steps or click here for more detail to ensure that you get your car running again safely. Position the donor vehicle so that its battery is as close as possible to your battery. Put both cars’ transmissions in park, with their hoods open and engines off. Attach the red positive cable first to the positive terminal of your dead battery, then to the positive terminal of the donor battery. Attach the black negative cable first to the negative terminal of the donor battery, then to an unpainted metal surface under the hood of your vehicle. Start the engine of the donor vehicle, and let it run for a few minutes to put some energy into your battery. If this fails to get you started after a few tries, call your mechanic and get a tow truck. It’s likely to be something more complicated. Normally, this small electrical drain is not a problem. But an old or weak battery combined with some other electrical or charging problem can lead to a failure. Operating all these systems simultaneously on short-trip cycles can deplete the battery, because there isn’t sufficient time to recharge it. At some point, the battery will be unable to start your vehicle. This type of operation can also damage your battery, producing what is called acid stratification. This causes the battery acid to be concentrated on the bottom of the battery, with not enough acid on the top, and reduces battery performance. Bad-weather driving, when you also have the wipers and heater blower running continuously, makes the situation worse. The battery will ultimately fail. Corrosion deposits on your battery terminals and cables can seriously reduce the amount of power that flows to and from your battery. This means that your car may not get enough power to start, and that your battery may not get enough power back from the alternator to fully recharge it. At some point, this will result in a dead battery. Similarly, if the cables are loose, they may not be able to pass enough electricity from or to the battery to keep everything charged and running. Even though many of today’s batteries are “maintenance-free,” some still provide access to the inside. If the liquid inside the battery gets low, the battery will be unable to produce enough power to get your car started. Your battery depends on your charging system to keep it working properly. When your battery consistently gives more power than it receives, it will fail. Your charging system needs a good alternator with a correctly tensioned drive belt that’s in good condition, as well as correctly functioning electronic components. If one of these elements wears out or fails, it’ll have a direct effect on the health of your battery. Cold weather is a battery killer. Your battery may work fine during the spring, summer and fall, but it can fail when winter weather hits and the mercury drops. Low temperatures slow down the chemical process inside your battery. It takes longer to charge, it puts out less power, and it can get overloaded easier when you are running the defrosters, the heat, the wipers and the lights at the same time. A brand new battery that puts out full power when the outside temperature is over 70 degrees will only produce half of that at 5 degrees. So if your battery’s condition is marginal, it may be unable to start your vehicle when it’s freezing outside. All batteries have a lifespan. Whether they are in your smartphone or your car, they will eventually fade and die. When this happens, your car won’t start. Inside the plastic box that forms the outer case of most batteries, there are plates made of lead and lead dioxide. These are submerged in a liquid that is composed of two-thirds water and one-third sulphuric acid. This liquid permits a chemical reaction between itself and the plates, thereby generating electricity for your vehicle. But starting the car and running the electronics inside the vehicle can deplete the battery. That’s why your car has an engine-driven alternator, to charge the battery back to its normal level. As long as your battery and charging system are in good condition, the battery should be ready to do its job, day in and day out. Unfortunately, battery problems are the top reason cars fail to start and get stuck on the side of the road. Fixing a bad battery is a fairly straightforward process. While the battery may be the lead player in this drama, there are some other related components with important supporting roles. 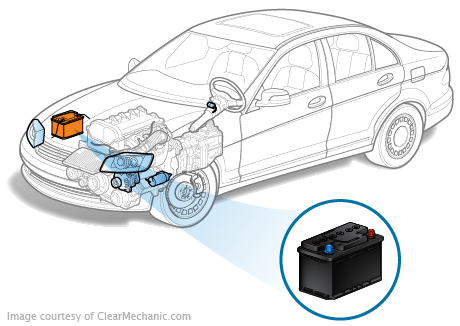 Your mechanic or several auto parts stores can check whether your battery is truly dead. If it can hold a charge, you may not have to replace it yet. If the battery will no longer hold a charge, it must be replaced. You should select a good quality replacement battery that meets the manufacturer’s specifications. Your mechanic can help you with this. If your vehicle won’t start, the problem could be in the starting system. Your mechanic can check the starter, the solenoid, the relay and other related parts. Any corrosion on your battery’s terminals and cables should be cleaned with water and a wire brush. Wear eye protection and gloves. Be careful not to inhale the toxic dust from the corrosion deposits, or get it on your skin or clothes. Loosen and remove the cables and their clamps first so that you can do a thorough job — but be aware that removing battery cables can mess with your car’s electronics. You may be able to attach a memory device to save its settings, or you may need to get your car service to reset these components. If your battery will still hold a charge, and you’re able to check the water level, make sure that the liquid is up to the fill line. Add distilled water to top it up if necessary. Wear eye protection when you do this, as there is sulphuric acid inside the battery. Some of these are within your control, and some are not. You may live in an extreme climate where you are limited to short-hop driving, but you do have a choice where the other items are concerned. Taking good care of your car, managing its electricity consumption and having it serviced regularly will go a long way toward extending the life and the performance of your battery.